I love painting snow. We just haven't gotten much of it here in Virginia the last two years. I almost miss Snowmaggedon! We didn't have power during much of it so my time was spent trying to stay warm rather than painting. Quick, light snows like I have painted here are much more pleasant. There is just enough snow to be beautiful but not enough to interfere with life. This was the second snow we had last week. The painting from my last post was painted during the first one and we are expecting a third at the end of this week. Hard to believe considering the temperatures today were in the high 60's and it felt like Spring! I have made a point of painting very small this month. My schedule is really tight and about to be worse as I prepare for Art League Board meetings and the Patron's Show which we will begin hanging next Tuesday. It will be frustrating to try to work on a larger studio piece. Working this small I can take advantage of the hours I have between appointments and taking care of Gypsy. Each little painting has been completed on the same day that inspired it. 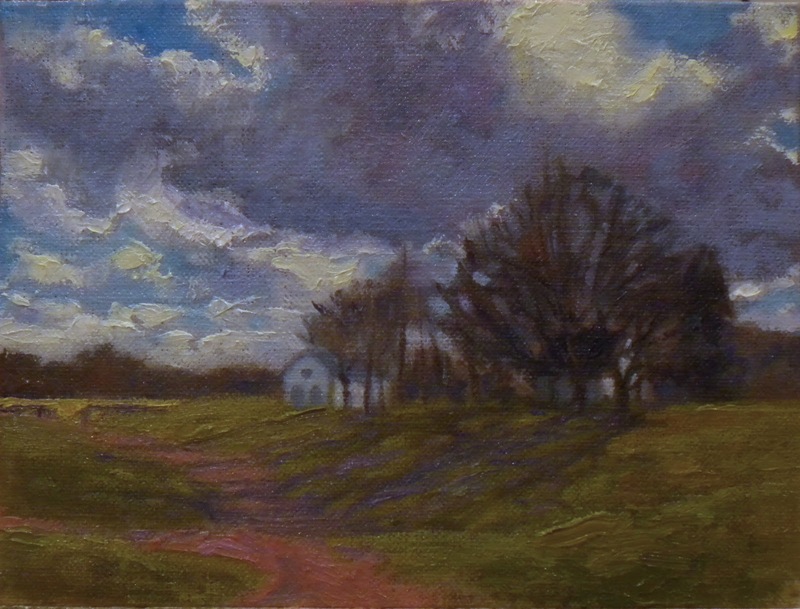 I also like the idea of painting the same scene in different weather conditions and I think these little paintings will inspire larger works. I think a grouping of 6x8 paintings of the same theme might prove interesting as well. I only had an hour and a half to work because I needed to leave for an appointment which took up most of my afternoon. By the time I got home this light was long gone but, as usual, I had some digital photos to refer to. I had all the major shapes and light and darks in place and had established my palette so I could easily finish in the studio. I did use Prussian blue along with utlramarine and cerulean. I mentioned yesterday I had used Prussian blue for the first time while painting that copy of George Bellows' painting "The Palisades". I could tweak this a little but I don't think I will. I would rather keep it in the moment so to speak. 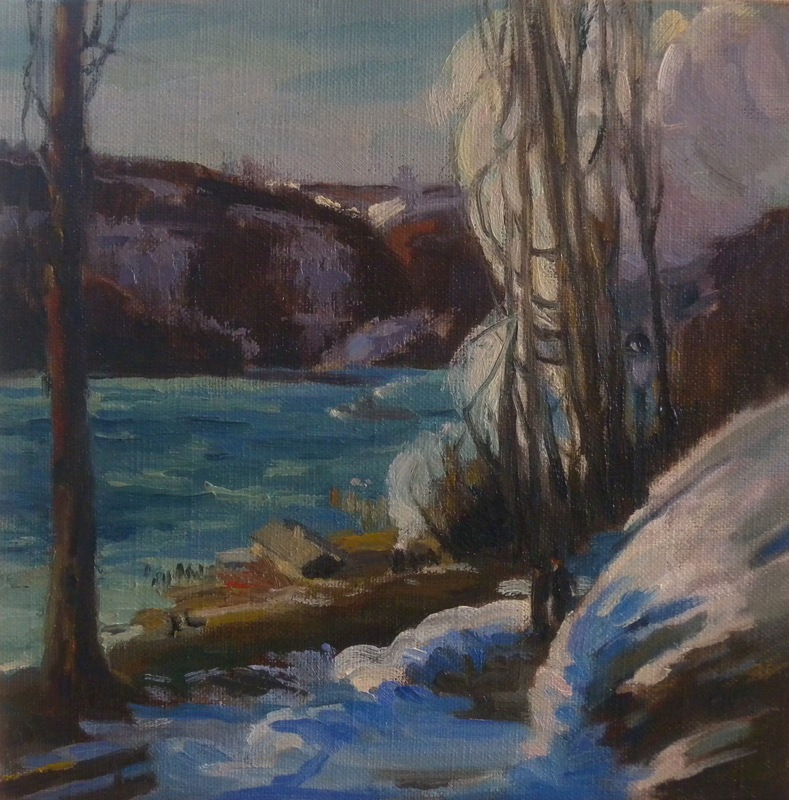 My copy of a detail of George Bellows' "The Palisades"
I have been studying George Bellows again. It is cold out and it has been a snowless winter. 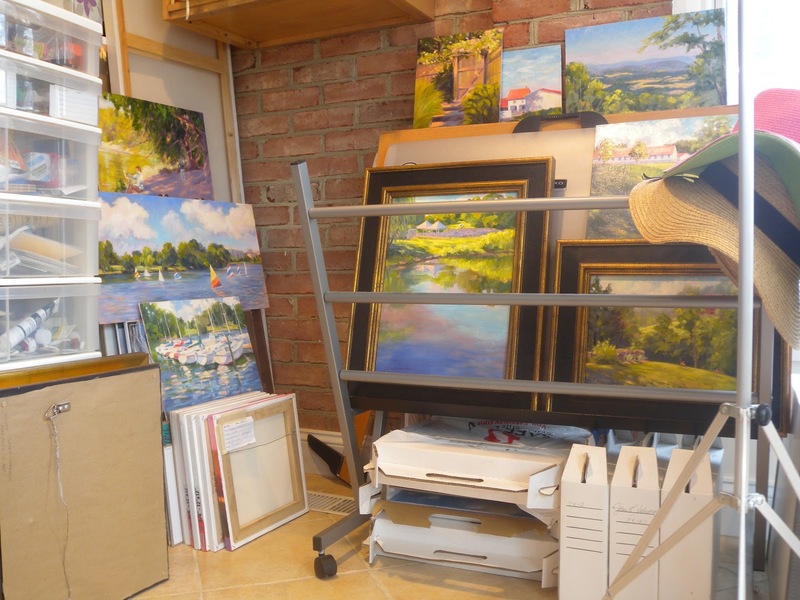 When I look around my studio I am surrounded by paintings with blue skies and fluffy white clouds or the golden, diffuse light of a summer morning or autumn day. Winter is hard to find among my paintings. I have been analyzing why. The light is sharper in winter and the skies more dramatic. I love the elongated shadows that seem so much more prominent in this season than in others. Yes, it is cold out but I would take this weather over the triple digit, humid, buggy days of last summer. 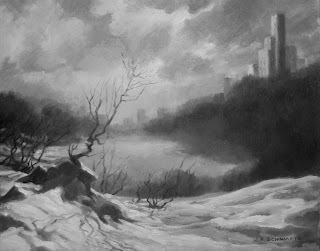 So, why don't I paint winter scenes? Simple answer, I am not good at them. Solution, learn to be. My favorite George Bellows paintings are the early ones, particularly the winter scenes along the Hudson. I prefer his winter trees to his summer ones. Winter trees have always been a stumbling block for me. It has been a long time since I have copied a master painting and I had forgotten how much you can learn. Yesterday I pulled out an 8x8 inch clear primed linen panel and painted this detail of "The Palisades" painted in 1909. The original is 30x38 inches. I would like to spend time doing more of these and as they are copies just for study purposes it is best to stay small. Added to my usual palette was Prussian blue, thalo blue and Payne's gray. The other colors I used were ultramarine blue, cerulean blue, cadmium red, alizarin red, yellow ochre, cadmium yellow, naples yellow, burnt sienna and titanium white. It took some time mixing colors to come close to those in the Bellows painting. I found some wonderful greens with Prussian blue and ochre. I haven't decided which painting I will tackle next but I am sure it will involve painting bare trees. 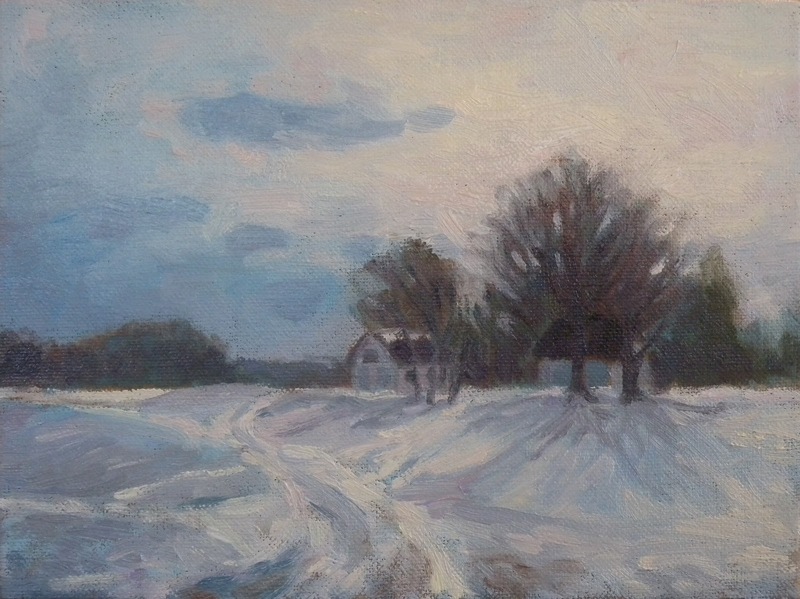 The test of what I have learned is when I go out and paint more of my own winter scenes such as the one I showed you yesterday. 3rd Session on "Above Cayuga's Waters"
I have almost finished this one and if I had started earlier today I would have. I want to work on the shoreline and when you click the image to enlarge it you will see I have scratched in an indication of masts and rigging that will belong to some sail boats docked in front of the central group of trees. I am sure there will be other minor tweaking before I am finished. The scene is on Lake Cayuga in Ithaca New York and viewed on the top of the hill is Cornell University. The title is taken from the first line of the Cornell alma mater, "Far above Cayuga's waters with its waves of blue reared against the arch of heaven looks she proudly down". Just indicated in the mist is the Clock Tower on the right and second from the left is the I.M. Pei Johnson Art Museum. My husband and I were out on a launch on the lake at dawn early this fall. The mist had already lifted from the surface of the lake and had just made it over the trees. There were so many beautiful moments that weekend. I will have to do some paintings from memory and maybe use some photos to use as light references. This one was a composite of three photos I took from the launch. I combined the sky as it appeared in one with the view of Cornell in another and the shoreline with sailboats from a photo taken further up the lake. Together I think they make a good composition. Speaking of mist.....Yesterday, Sunday, four members of the ALPAP's (Art League Plein Air Painters) were to join me to paint above the Potomac from the property where Gypsy lives. 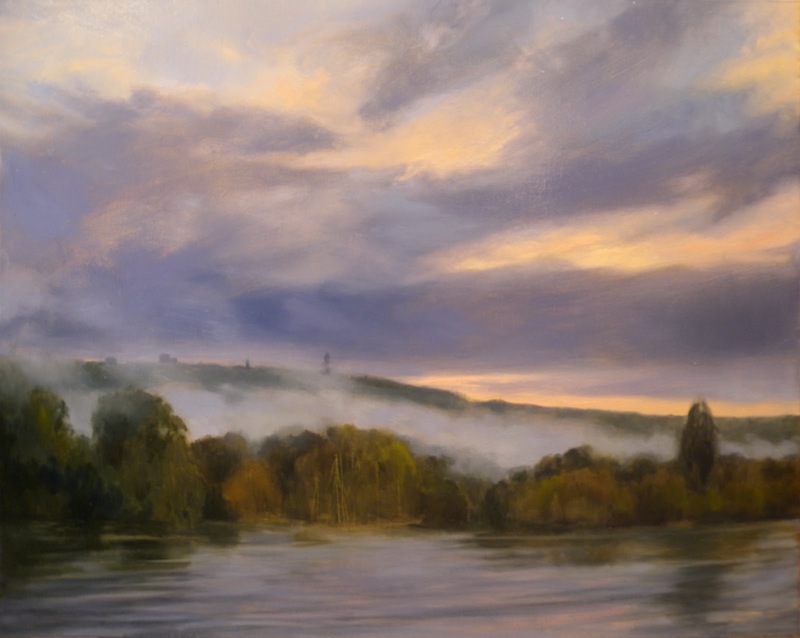 We were hoping for the promised sun breaking through the fog in the afternoon to provide some beautiful atmospheric affects to paint. Instead we had a white out. As the fog thickened the mist became heavier and we decided to try again next week. Jack Dyer soldiered on and when his paper was too wet to sketch on he reverted to photography. I know he got some good shots around the stable area. I took the opportunity to give Gypsy some exercise and Jack took some wonderful photos of us. It is rare for me to have photos of the two of us together as I am usually behind the camera. Looking at her here it is hard to imagine I was so close to losing her in July. She has made an amazing come back! The paintings from yesterday's post are on their way to New York. 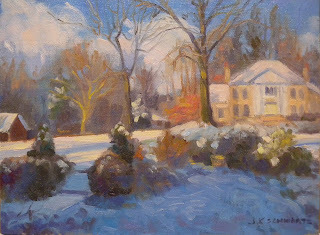 They will be on exhibit in the Main Gallery at the SALMAGUNDI CLUB www.salmagundi.org from JANUARY 21st to FEBRUARY 8th. ﻿﻿ TaaDaa, an image! This did not get here by the usual means. Actually I found my way to Picasa Images where my blogger images are stored once they are uploaded here from my computer. Since I was unable to load new photos directly here any longer I tried uploading first to Picasa and then uploading them here from that site. It takes longer but it works. 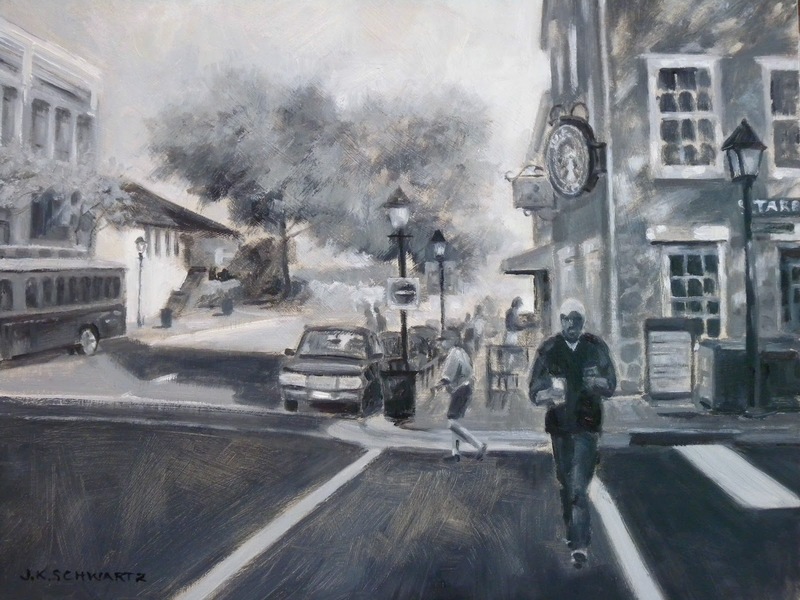 I will now try to find out why I have to do it that way but for the moment I would prefer to catch up with my blogging and showing you paintings. I am holding my breath because I am going to attempt another one and am not sure how to get back. Here goes.... IT WORKED! It is now 2:00 in the morning and I will put a comma here. It was one of those nights when I couldn't sleep because my mind was trying to find solutions to things. I knew I wouldn't doze off without giving this a try and I am surprised and delighted that it works! I continue to work on the image problem and if all fails with Blogger I will look into creating a blog on my website. Please don't give up on me! Do check in from time to time because if I do move my blog I can redirect you from here. I have to believe there is a solution with this site and we just haven't found it yet. I am not alone reporting this issue but I guess there are not enough of us for Blogger to pay attention to us. Other problems seem to be more common and they are putting their efforts there. Work in the studio continues. "Above Cayuga's Waters" approaches completion. My commissioned work "Clouds and Gulls", based on the 8x10 inch plein air painting that sold this month at the Salmagundi Club, is complete and will be delivered to the new owners in North Carolina along with "Blowing" which they have also decided to purchase. 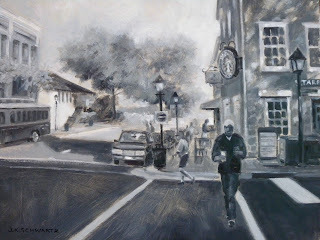 We are having quite a warm up here in Virginia and the Art Leage Plein Air Painters (ALPAPs) are springing to life. There is a paint out this afternoon in Great Falls and we may have another tomorrow. Today is foggy and gray but that can inspire some interesting painting. What No Image? That's What I Said! Well, this is a first. A post without an image:( This is not my choice but what Blogger has left me with. Do I know why? No! All I know is that I have wanted to upload images and post for over a week now and I do not have a browser button. Okay, so things go wrong from time to time. Surely this must be fixable. Thus far it has not been. I went immediately to the help section, I obediently followed the suggestions from Blogger and made the appropriate adjustments but NADA! I am unable to reach a human being. I have rebooted my computer numerous times and still nothing. I accessed my blog from my husband's computer and still the same problem. I tried my laptop that I often post from and there I don't even get to see a tool bar. I am pretty exasperated as I do enjoy blogging and my blog is about my paintings which I can't show you. I checked the help forum and I see a number of people have the same complaint but there is nothing said about what is being done. If anyone out there has gone through this and has some ideas I am all ears! I will keep trying to work things out on Blogger and perhaps in my next post I will be able to show you the most recent paintings. As I hope you come to this Blog to see, not just to read about paintings it doesn't make much sense for me to keep blogging without images.